Rising tensions between Saudi Arabia and Iran, as well as the kingdom’s weekend crackdown, have unnerved investors this week. But, notably, markets in countries outside of Saudi Arabia have been hit harder than the stocks in the kingdom, likely reflecting investor worries about the possibility of regional tensions increasing. Political uncertainty in the region is offsetting the boost from oil, analysts say. Rising tensions between Saudi Arabia and Iran, as well as the kingdom’s weekend crackdown, have rattled markets in the region. 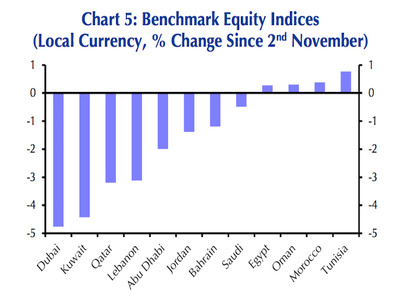 Lebanon’s benchmark equity index has fallen about 3% since the weekend. Qatar, Kuwait, Dubai, and Abu Dhabi’s benchmark equity indices have also tumbled in recent days. Notably, the stock moves in Saudi Arabia have been relatively modest (aside from the shares of companies owned by people who have been detained). Saudi Arabia’s Tadawul index is down by about 0.5% since the end of last week. “We suspect that this reflects concerns that the Kingdom’s increasingly aggressive tone towards Iran will stoke regional tensions that could ultimately morph into a military confrontation,” Jason Tuvey, Middle East economist at Capital Economics, said in a note to clients. Lebanese Prime Minister Saad Hariri — a dual Lebanese-Saudi citizen — resigned in a surprise announcement on Saturday during his trip to Saudi Arabia. Hariri is part of a joint government that includes Hezbollah, the Iran-backed militant group, and he used his resignation speech to criticise that group and Iran. On Thursday, Reuters’ Laila Bassam and Tom Perry reported that Lebanon believes Hariri is being held in Saudi Arabia. A senior politician close to Hariri told Reuters that Saudi Arabia had ordered him to resign and put him under house arrest. Saudi Arabia has denied reports that he is under house arrest. Meanwhile, the kingdom ordered its citizens out of Lebanon, and warned against travelling to the country. Meanwhile in the United Arab Emirates, the UAE central bank requested commercial banks and finance companies in the UAE to provide details of the accounts of 19 Saudis, commercial bankers told Reuters on Thursday. The UAE, and particularly Dubai, is among the main places where wealthy Saudis park their money abroad. While climbing oil prices theoretically are a good sign for the region, which still relies heavily on energy, the heightened regional tensions could erase those gains.